Join the raccoon party with the kid's game Raccoon Rumpus. Kids and adults will have a blast matching their color and costume dice together to pick out costumes for their raccoons. Great illustrations make this game fun with bright colors and clear pictures. 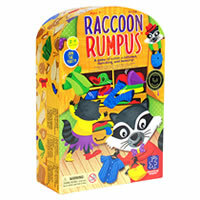 Raccoon Rumpus is very easy to learn how to play and a lot of fun for kids. The game teaches basic skills in playing board games as well as color matching. Kids as young as 3 can play. Grab this as a present or just add it to your collection. You'll be glad you did. Be the first to collect five costume cards and you'll be the winner. You'll get four raccoon cards, 20 costume cards, a jumbo color die, a jumbo costume die and the official Raccoon Rumpus game rules and instructions. Please keep in mind that the official Raccoon Rumpus childrens rules and instructions could be different depending on the game version you have. The rules below are some of the exact directions on how to play Raccoon Rumpus. Share with us your comments, funny stories, tips, advice, strategies, creative ways to play, questions about how to play, problems with the rules or anything you want about Raccoon Rumpus. All submissions will be reviewed within 24 hours. Click here to add your Raccoon Rumpus comments.